Chrissy Cannella potted her team leading second goal of the season for the Knights. 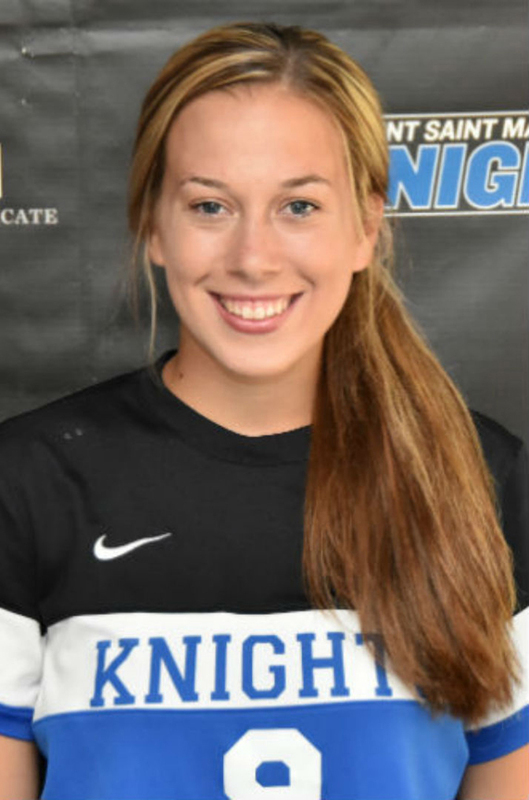 Oneonta – The Mount Saint Mary College Women’s Soccer team opened play at the 2018 Mayor’s Cup on Saturday with a 1-1 draw at Hartwick. Chrissy Cannella potted her team leading second goal of the season for the Knights. Hartwick jumped out to an early 1-0 lead, the Mount’s first deficit of the season, when Tanner Reed cashed in a penalty kick at 18:04 to give the Hawks the early one goal advantage. Just over three minutes later, Cannella put away her second of the season to draw the Mount even and close out the scoring in the game. She finished off a shot off a foul from the corner at 21:14 to push her team lead in goals to two and points to four. Shots at the intermission were 7-4 in favor of Hartwick and corner kicks were even at 1-1. Although the Hawks could not score after halftime, they outshot the Mount 10-1 in the second half and 4-1 in the two overtime sessions. Freshman Liz Ellsworth continued her strong play in goal for the Knights with a career-high 16 saves, including 12 after halftime. Cannella produced half of the Mount’s six shots in the game, while Hartwick featured five players with at least two attempts in the game. Reed and Rachel Pine each finished with four shots for the Hawks, while Cassandra Robataille earned the win in goal with four stops. Hartwick finished the game with a 21-6 advantage in shots, including a 17-5 edge in shots on goal. Corner kicks in the tilt also went to the Hawks, 8-2, including 7-1 after halftime.